Your search for the perfect dinner napkin is over! - Soft enough to use even on the most sensitive mouth. - The most absorbent disposable napkin on the market. - Packaged in sturdy boxes allowing for easy storage and dispensing. - Made of completely recyclable material which allows ease of mind to eco-friendly consumers. - SimuLinen's napkins are a cost effective, yet elegant replacement to linen. You will not be disappointed! Order now, and when you do, consider getting another box for your mother, friend, as a teacher gift, for holiday gift-giving, or even to keep on hand for a last minute hostess gift. SimuLinen was founded in 2002 and is proud to offer disposable tabletop products for home use as well as for the food service, hospitality and health care industries. Curious as to how our napkins & guest towels are the best? Type in "The SimuLinen Difference" on your search engine to watch our product videos! DURABLE and ABSORBENT: It's hard to find a durable, high quality napkin that's thick enough to be sufficient for every meal. SimuLinen's Signature Dinner Napkins are THICK, DURABLE and ABSORBENT and your guests will surely wonder where you got them. SOFT and DISPOSABLE: Made from the softest and best DISPOSABLE material available on the market today. All of our products are much more eco-friendly than re-washing cloth-linen napkins. LINT-FREE: Don't you hate wearing nice clothes and putting your napkin on your lap, only to realize later that your nice clothes have napkin lint all over them? 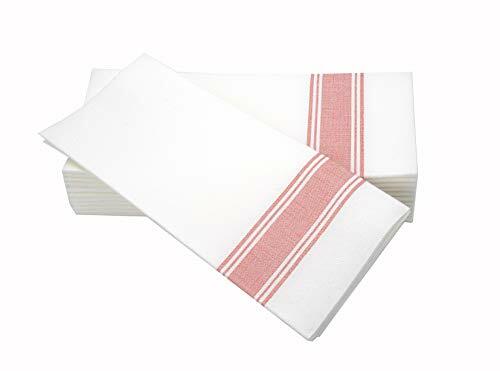 SimuLinen's napkins are lint-free! If you have any questions about this product by Simulinen, contact us by completing and submitting the form below. If you are looking for a specif part number, please include it with your message.